CapitaLand Retail China Trust’s FY18 results continue to exhibit steady growth momentum. Asset swap deal injects new life into CapitaLand Retail China Trust, anchoring its dominance and growth potential in Hohhot. Potential to surprise on the upside as strong balance sheet supports further M&A opportunities. Maintain BUY; Target Price raised to S$1.65. Riding on a portfolio with clear organic growth catalysts, CAPITALAND RETAIL CHINA TRUST (SGX:AU8U) continues to offer attractive yields of > 7.0%. In addition, with a recapitalised balance sheet, we believe the time is ripe for CapitaLand Retail China Trust to take on a more aggressive acquisition-led growth strategy – starting with its asset swap deal in Hohhot. Our Target Price is adjusted higher to reflect the merits of the transaction, which offers good long-term growth potential. Our Target Price is at the higher end of consensus estimates as we believe new acquisitions have higher growth potential. With a visible pipeline from the sponsor, we believe that it is an opportune time for CapitaLand Retail China Trust to look at acquisitions. Aided by an active asset reconstitution strategy, CapitaLand Retail China Trust continues to realise value for investors and proceeds can be deployed to value accretive deals, which we believe could lead to higher earnings momentum. CapitaLand Retail China Trust delivered another robust quarter, as its multi-tenanted malls continued to shine in 4Q18. Occupancy remained healthy at 97.5% while rental reversions came in strongly at +9.1% (averaging +10.9% for FY18) as its active repositioning and tenant remixing strategies, among others, bore fruit. 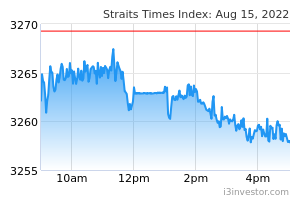 Maintain BUY; Target Price raised to S$1.65. We raise our DCF-based Target Price to S$1.65 after inputting incremental contributions from CapitaLand Retail China Trust’s well-timed asset swap into Yuquan Mall. A significant depreciation of the RMB versus SGD, and a downturn in Chinese consumption. In 4Q18 RMB terms, CapitaLand Retail China Trust’s gross revenues and net property income (NPI) came in 6% lower y-o-y and 12% higher y-o-y at RMB274.0m and RMB181.1m respectively. The higher revenues were mainly led by higher portfolio revenues for its multi-tenanted malls with notable increases seen at its sizeable malls in CapitaMall Xizhimen, CapitaMall Wangjing, CapitaMall Grand Canyon, which benefitted from past strong rental reversions. We also note that Wuhu also had a one-off compensation from the exit of a major tenant. Keeping a tight lid on operating costs, CapitaLand Retail China Trust delivered an overall improvement in NPI margins to 64% in 4Q18 (vs 61% in 3Q17). In SGD terms, revenues and NPI came in 3.0% and 8.8% higher y-o-y at S$55.7m and S$35.8m respectively due to the weakness in the RMB vs SGD. Distributable income jumped 7.7% y-o-y to S$23.7m, boosted by the contribution from the 51% interest in Rock Square (S$2.2m in 4Q18, nil in 4Q17), which was acquired in January 2018. DPU rose by 2.1% y-o-y to 2.42 Scts on the enlarged share base post fundraising for the Rock Square acquisition. For the full year, DPU came in at 10.22 Scts, in line with our forecasts. CapitaLand Retail China Trust’s portfolio of malls continue to exhibit strong operating statistics, with the portfolio tenant sales increasing by 19.9% in 4Q18 (18.8% y-o-y for FY18) on the back of a 28.1% rise in foot traffic (19.4% for 9M18), which was largely attributed to the successful repositioning efforts of Rock Square. On a same portfolio (excluding Rock Square and CapitaMall Wuhu) basis, sales would have dipped by 0.5% in 4Q18 (+1.3% for FY18), against a 2.6% drop in traffic (vs +0.5% for 9M18). We understand that the weakness seen in 4Q18 was mainly due to CapitaMall Mingzhongleyuan, which is seeing operational challenges due to competition in the region. Average rental reversions were positive at +9.1%, with notable increases at Rock Square (29.3%) and CapitaMall Xinnan (17.3%); while key sizeable malls – CapitaMall Xizhimen, Wangjing and Grand Canyon continued to deliver positive reversions of 5.0%, 6.1% and 7.8% respectively. Portfolio occupancy rates remained stable at 97.5% in 4Q18 (vs 97.7% in 3Q18). While most multi-tenanted malls remain stable at 98.5%, we note that Capitaland Mingzhongleyuan, which is under stabilisation, is still undergoing an occupancy flux, with a slight dip in occupancy rate to 70.3% (vs 72.1%) and could improve sequentially on the back of a new anchor potentially taking up a majority of the vacancy at the mall. CapitaLand Retail China Trust reported a 1.7% rise in portfolio valuation from June 2018, largely as a function of stronger cashflows for its portfolio. Gearing remains stable at 35.4% (on a see-through basis), which falls within the manager’s comfortable range of 35-40%. Cost of debt nudged higher to 2.73% (vs 2.67% last quarter) post the recent round of refinancing; 83% of its debt cost is fixed. Average debt to maturity remains long at 3.47 years (vs 3.7 years previously) after taking into account the refinancing and extension of the expiry of S$120m in bridge loan to 2024. 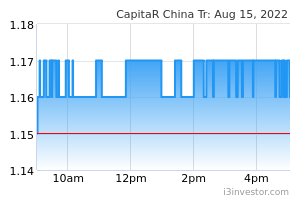 After this refinancing exercise, CapitaLand Retail China Trust has minimal debt expiring in the near term in 2019, with the next tranche to expire only from 2020 onwards. 80% of its distribution had been hedged as of December 2018. CapitaLand Retail China Trust also reported the acquisition of Yuquan Mall (RMB808.3m, 6% discount to valuations) in Hohhot and sale of CapitaMall Saihan (RMB460m, 8.4% yield) in a bundle deal with the vendor, who is the master developer of the surrounding precinct. The price paid for Yuquan Mall (RMB808.3m, 10,588 psm excluding car park) is in line with the exit of CapitaMall Saihan (RMB460m, RMB10,968 psm). While located just opposite the existing mall CapitaMall Saihan, the target mall – Yuquan Mall is almost double in terms of operating footprint (76,309 sqm) vs Saihan (41,938 sqm) but will be directly connected to the upcoming NuoHeMuLe Station on Metro Line 2 (opening in 2020) and three stops from the interchange station that serves Metro Line 1 (opening in 2019). The deal will be completed in stages with the REIT taking over possession of Yuquan Mall by 2H19, with a one-year lead time to lease up the mall, with an aim to complete the deal by 2H20. In the meantime, it is envisioned that Saihan will continue to operate till 2H20 when the mall will be closed progressively and handed over to the buyer. Recently completed, Yuquan Mall is currently empty and enables CapitaLand Retail China Trust to work its magic in curating an optimal tenant mix which will better serve the needs of its immediate catchment. We see benefits from a larger operational footprint which empowers the manager to curate a wider variety of tenant choices compared to what CapitaMall Saihan can offer, which we see limitations from its size. The manager targets to achieve at least a 6.0% return (first year NPI/purchase price) which we believe will continue to increase over time. Compared to Saihan which currently has 45% of its NLA leased to an anchor, it is envisioned that Yuquan Mall will have only 28% of its NLA leased to anchors, meaning that the growth profile for Yuquan will remain exciting as it matures over time. With monies expected to be paid/received in progressive payments over the next 1.5 years, gearing for CapitaLand Retail China Trust is expected to not increase substantially from current levels.